Greetings, beer fans. It’s been way too long, but I will try to catch you up without getting too lengthy. Please read responsibly! Well, where to start? How about an update on a couple of items from the previous newsletter . . . I brew this malty German Märzen each year in late June to have on tap during the Oktoberfest season. It features a caramel sweet flavor with enough German noble hops to give it some balance. This is an easy one to like. Strange Addiction– Brewed May 30, 2018. 12.1% ABV (so far), 78 IBU. When I last wrote about Strange Addiction in the previous newsletter, it was conditioning in glass carboys on cacao. 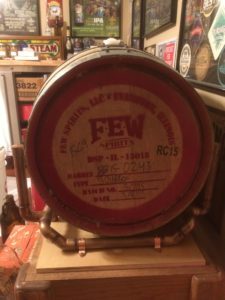 I finally racked it to the bourbon barrel on Friday September 7, 2018. It conditioned in the carboys for about 2½ months, which was about a month longer than I had planned, but there’s a good reason for the extensive cacao aging. 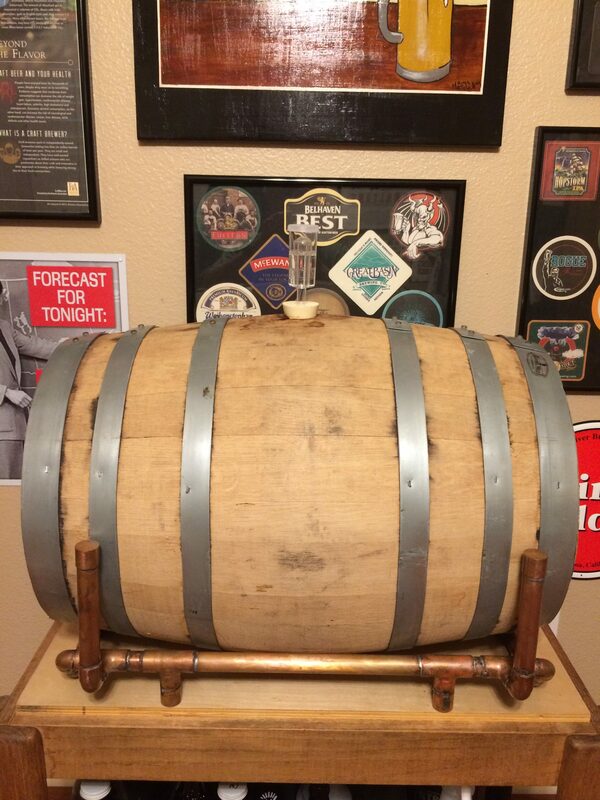 At the end of June I was planning to add some fresh bourbon to the barrel for a few weeks to get it ready for the stout. I first thought to fill it with water to confirm that it was watertight. 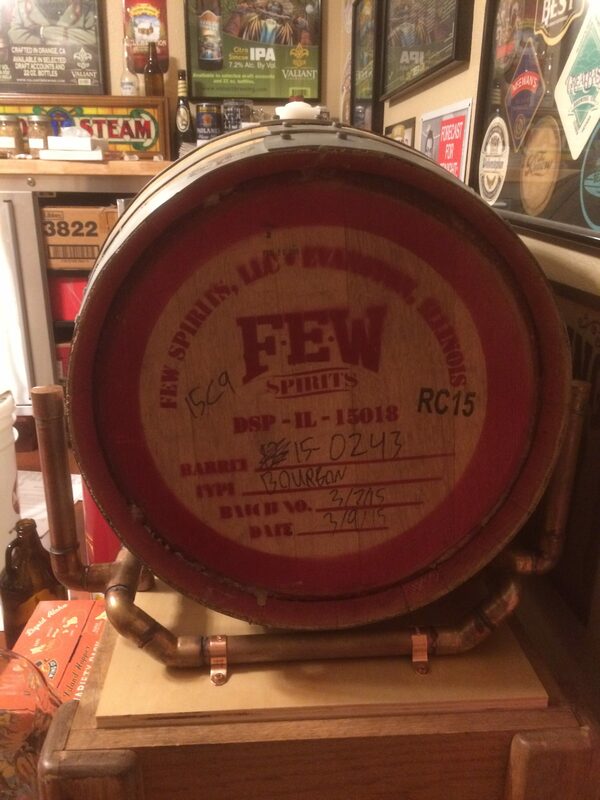 Good thing I didn’t just put the bourbon in the barrel without checking – that would have been an expensive mistake. It leaked like a sieve. 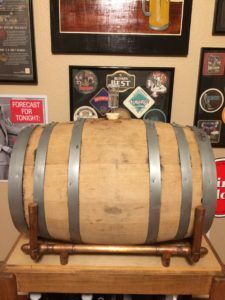 Yes, I let it sit dry for too long (I bought the barrel at the end of November, 2017), and who knows how long it had been dry before I got it? It took me about a week of filling the barrel with water and draining it each day before it was leak-proof. I racked the 15 gallons of Strange Addiction to the barrel and topped it off with the 300 ml of bourbon that I had just removed. I also checked the gravity to see if it had changed at all during the 2½-month conditioning. I expected no change, as I had not seen any evidence of slow fermentation during that time. I was very pleasantly surprised to find it had dropped a couple of gravity points to 1.027, which raised the alcohol level to 12.1% ABV. Now if I can just be patient for a few months and let this beast develop the sweet bourbon and oak notes; that’s not going to be easy. I’ll start tasting it in early January to assess its progress. Strange Addiction’s home for the next few months. So much for the old news. Let’s get to the recent stuff. I’ve brewed numerous IPAs (my own recipes), but not one of them has been to my satisfaction. Although most of them were pretty good, they just never turned out like I wanted them . . . until now. Finally, I nailed an IPA. Hurricane Mac is a Category 5 Tropical Fruit Hop Storm. It’s a New England style IPA (juicy and slightly hazy), with overwhelming tropical fruit and citrus notes. In spite of the relatively high IBU level (this is per BeerSmith, my brewing software, and I suspect it’s not really that high), I used only 1½ oz. of hops in the boil (12½ gallons volume post-boil). Instead, I saved most all of my hop additions for whirlpooling and dry hopping – 21 oz. of Citra, Mosaic and Zythos. It’s not a bitter bomb. In fact, as I noted, it’s actually a tropical and citrus fruit bomb. It’s delicious, and very refreshing (but watch out, at 7% alcohol, it can put the hurt on you). San Andreas Malt: Brew day September 19, 2018. This is my first attempt at a California Common style lager. So you’re not sure what that style is? Think Anchor Steam Beer (thanks to Fritz Maytag for rescuing this style from the dustbin of history when he purchased Anchor Brewing in 1964). Although this is not a clone of Anchor Steam, I am hoping to get it pretty close – caramel malty, but dry, with noticeable hop bitterness and flavor. What’s more common in California than earthquakes, huh? That’s why I’m calling it San Andreas Malt. We’ll see how it turns out. I’ll brew in a couple of days, then ferment and condition for several weeks (it’s a lager, so fairly lengthy cold conditioning is required). This is a collaboration brew with Jeff Nash (he’s been brewing for awhile, but it’s his first foray into all grain brewing). I should have it on tap in early November. 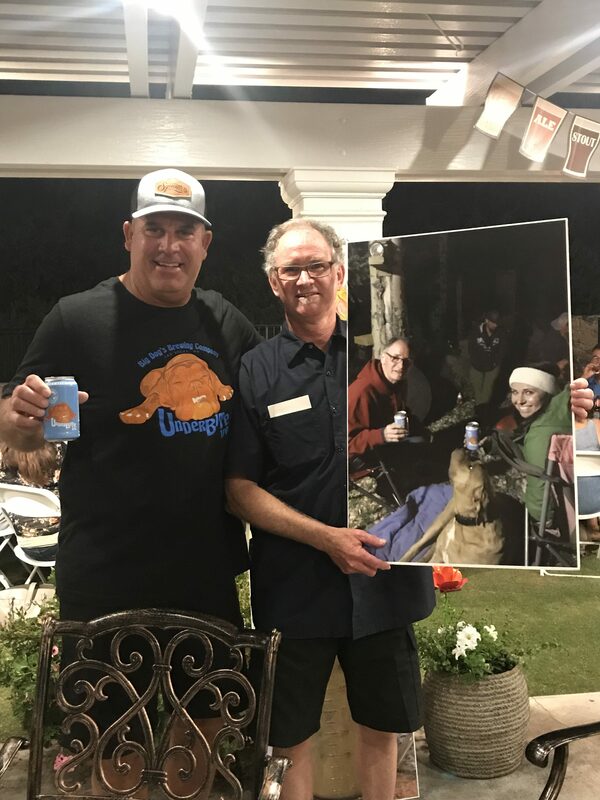 I put on my annual Beer Appreciation Party on Saturday September 8, 2018 (we missed it last year due to extensive backyard remodeling and construction). There were about 60 people in attendance. The theme this year was IPAs. Sheila and I provided some; several attendees supplied many more. We served samples of 13 different IPAs over the course of the evening – from Anchor’s Liberty Ale (the first post Prohibition American IPA), to Hurricane Mac, to Pliny the Elder (the IPA game changer, and still the IPA standard bearer). Of note, Don and Donna Evans came from Utah to attend the party, and Rose Evans came from Arizona to attend. Now that’s a real commitment to beer! 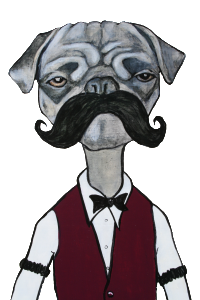 Don brought Underbite Double IPAfrom Big Dog’s Brewing Company in Las Vegas, Nevada. It’s a double IPA that’s not available in California (or anywhere outside of Nevada). There is an interesting story behind this beer getting all the way to Mac’s Brew Pub, the brewer, (Amanda Koeller), and the dog who inspired it (Sorrel). I will enlighten all of you when I post a beer review on Underbite Double IPA very shortly. You won’t want to miss it. Don Evans (with Mac) presenting Underbite Double IPA at Mac’s Beer Appreciation party, September 8, 2018. Well, that’s all I have time for right now, and this newsletter is getting longer than I had intended. 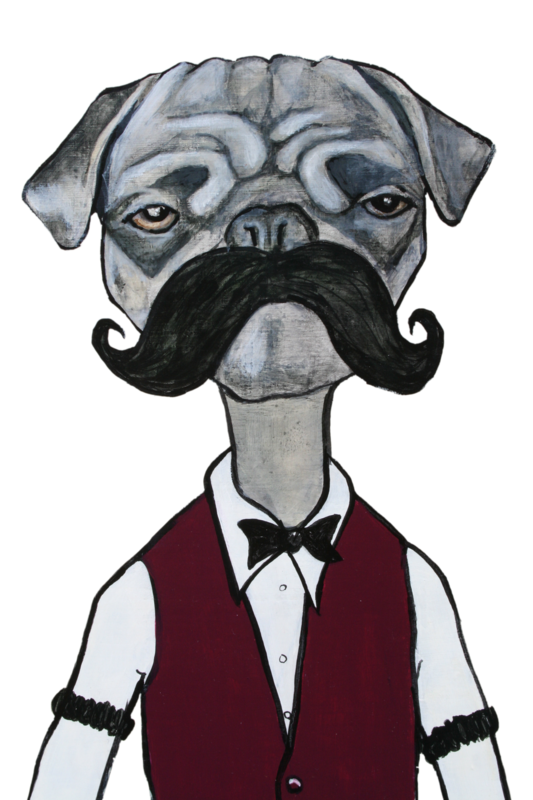 Check back real soon, because I plan to post some beer reviews, including the review of Underbite (since I just teased you with a little introduction) in the next few days.